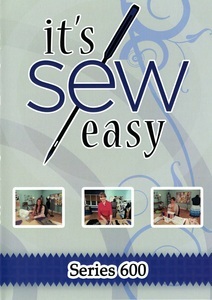 It’s sew easy – the place for creative and contemporary sewing with instructions, videos, patterns and projects presented by leading sewing experts for beginners and experienced sewers. Featuring apparel, quilting and home dec. This season is all about the classics and features the Little Black Dress. Angela Wolf has an extended lesson on choosing the fabric and silhouette for you own little black (or any color you like) dress and sewing darts. Then, fit expert Peggy Sagers takes a basic tee shirt pattern and turns it into a classic sheath dress. The key to making a signature piece work is accessories. Dress it up or down with a perfect scarf or wrap. Cookie Gaynor starts with a few simple tricks and fabric choices for scarves to increase your wardrobe quickly and stylishly. Lesson 2 of the Little Black Dress features silhouettes and sewing on silk with a French seam, all with Angela Wolf. Joanne Banko gives plain pashmina wraps a makeover with bobbin work from both the embroidery and sewing side. We expand our view of classics by adding surface embellishments to personalize your garment. Cindy Hogan makes appliqués from embroidery to add detail to any garment. Then, it’s our next lesson in the Little Black Dress from Angela Wolf and different seam finishes including the Hong Kong. Last is embroidery expert Eileen Roche and easy dress embroidery for beautiful style. Today’s show looks at a few classic details. Amy Alan has a serger lesson. She reviews the basic serger stitches and teaches when to use them and tension adjustments for each. Then, Angela Wolf introduces princess seams – why you use them, how to adjust for fit, and then how to sew them. Finally, Kenneth D. King has a couture technique for curved tucks on a fabulous top. The experts have adorable projects for the little ones in your life. We begin with a pillow from Vanessa Vargas Wilson. Open up the pillow for a play mat that might double as a naptime or car trip blanket. Then, we move on to another lesson from Angela Wolf for the Little Black Dress. Alter the neckline curve and make a new facing. Finally, meet expert Pearl Krush with a kid’s bedroll. Create your own fashion “opportunity” when you make your own specialty garment. Kathleen Cheetham starts out with pattern alterations to change your favorite top into a maternity top. Then, in our Little Black Dress lesson, Angela Wolf attaches facing and under stitches on a round neckline. Finally, Melissa Stramel features the ruffling foot as she makes a party dress– sewing for a little girl is a great sewing opportunity. Learn the details that will make your wardrobe a classic. There are little details that make a garment stand the test of time and they usually involve some sort of detail from the couture world. They are not necessarily difficult or time consuming – but they show you took that extra step to make your garment a classic. Amy Alan demonstrates serging - one of those techniques that is always classic. Then, we have another lesson of the Little Black Dress with Angela Wolf and how to use the lining as your facing. Finally, couture expert Susan Khalje has some special finish details for a professional look. Ribbons and trims have been around forever, but it’s only recently that we’ve seen so many new ways to actually use them as part of garment construction. Today’s experts use ribbons and trims as an integral part of their design. Joanne Banko shows how to embellish a dress with decoratively stitched bands you make yourself. Then, Angela Wolf uses bias tape trim on the neckline of the continuing Little Black Dress lesson. Last is Sunni Standing and a waistband for a pencil skirt created from ribbon. Certain garments just make you want to twirl around; they feel light and airy and make you think of dancing. It can be the pattern or the fabric but everyone knows that feeling. Today’s experts will show you how to achieve that look easily. Special guest and sewing expert Linda Lee starts out with a lesson on sewing with silk and hem finishes for the perfect edge to your flowing dress. Then, it’s time to attach the bodice to the skirt of the Little Black Dress with Angela Wolf. Last is a lesson on draping with Stephani Miller – this is a non intimidating way to get the perfect fit on a skirt from straight to flowing. Our experts show some of their insider tips for garment construction. First is sewing expert Linda Lee with a lesson on sewing with knits and pucker free hems. Angela Wolf is next with a Little Black Dress segment and how to deal with zippers that are just too long for your garment. Finally, Cindy Hogan demonstrates the way the professionals cut machine embroidered designs for appliqué. A classic style sometimes can use a change whether for fashion or fit. Fit expert Kathleen Cheetham teaches how to create a back yoke on a blouse to eliminate multiple darts or change to a more casual look. Then, it’s a lesson on sleeves for your Little Black Dress with Angela Wolf. Finally, Gretchen Hirsch alters a favorite pattern by adding a flounce for a fashion flare. Today’s experts provide a new perspective on machine attachments. You can do so many techniques faster and easier when you choose the right accessory. Cookie Gaynor is first with an updated take on circles using a circle attachment and decorative stitches. Then, Angela Wolf’s Little Black Dress lesson is hemming the vent on your dress. Finally, Clare Rowley shares her expertise on using sewing feet for easy ways to attach, trim, pearls, and sequins for an updated basic tee shirt. There many different silhouettes for a classic bag – the one you carry every day. This show will introduce two more possibilities. Vanessa Vargas Wilson introduces a mini rounded clutch purse with all sorts of size options. Then, it’s time to hem our Little Black Dress with Angela Wolf. Marie Zinno wraps up the show with an embroidered placemat purse – an easy way to have your choice of colors and patterns for a classic preppy look.